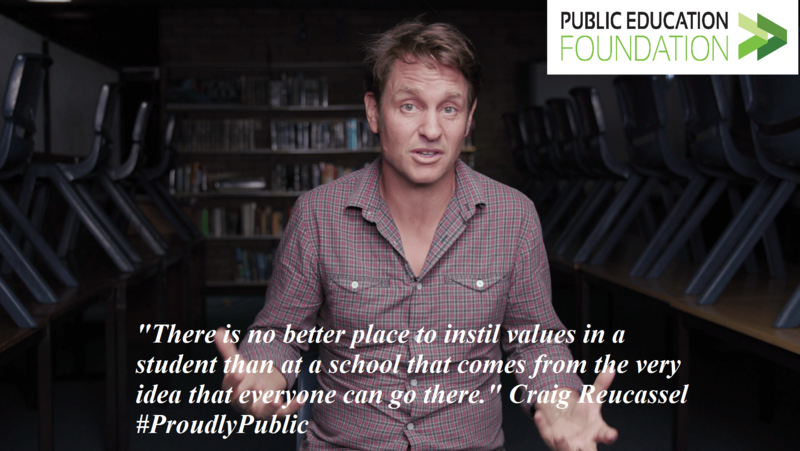 The Public Education Foundation is delighted to announce the launch today of its campaign “Proudly Public: Building Great Australian Lives”. The campaign highlights the pivotal place of public schooling in Australian life and invites viewers to consider how public education has shaped their own life experiences. The Foundation invited three high-profile Australians – TV personality Craig Reucassel, Professor Larissa Behrendt and former High Court Judge Michael Kirby – to share their formative experiences in public schools, and to comment on how these laid the platform for later success. Three young public school students also feature in the campaign videos to show how the aspirations of the young generation can be achieved with a vibrant, inclusive and quality public education system. “We want every student in public education to be known, valued and cared for and the Public Education Foundation campaign highlights our commitment to providing opportunities for all our young people to succeed,” Mark Scott, Secretary, NSW Department of Education, said. “At the Public Education Foundation, we believe that public schools are an essential pillar of Australian society,” commented David Hetherington, the Foundation’s Executive Director. “Tens of millions of Australians have benefited from public education as a springboard to successful lives. We want to shine a light on this great national institution, so we’ve asked a few famous Australians to share their stories with you”, Hetherington said. These stories take the form of short videos that will be published on social media over the coming weeks. The Public Education Foundation invites all interested viewers to like these stories and share them widely. You can find the videos and other resources at: www.publiceducationfoundation.org.au/campaign. We thank the NSW Department of Education and the Arts Unit for arranging the student talent and the filming location.